This post is a follow up to my earlier lecture on SRSD writing instruction. Although, these lectures are meant for course participants in the MOOC Helping History Teachers Become Writing Teachers that will take place between January 12, 2015 – February 24, 2015, feel free to make comments, or join our Twitter conversations under the #HistRW. Studies of history classrooms reveal that writing instruction of any kind is uncommon, even among exemplary teachers. Thus, student essays tend to list facts rather than argue claims, leave arguments unexplained, and only draw on evidence sporadically. A majority of adolescent writers struggle in writing a simple argument in history. Recently, research has focused on the discipline-specific demands of history writing. 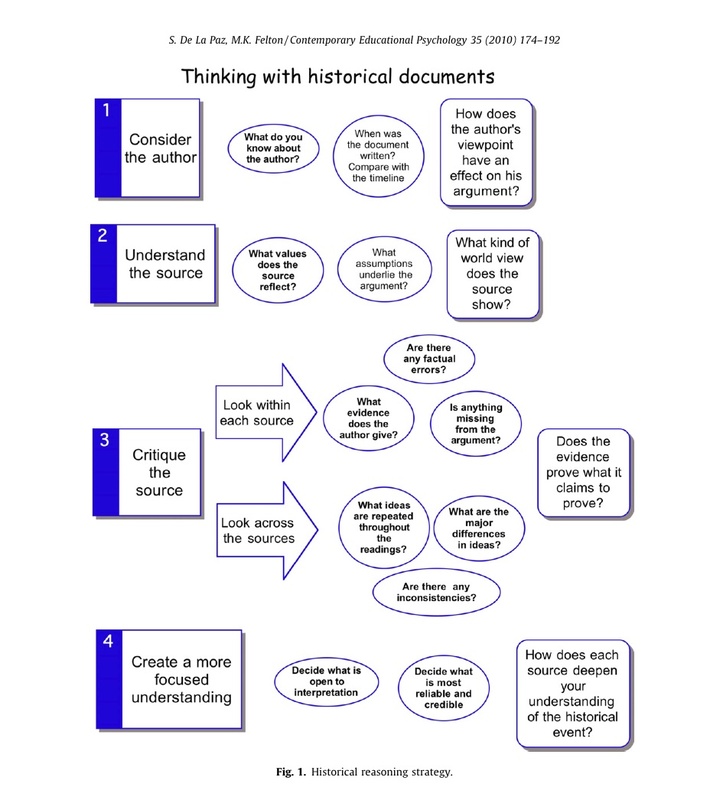 Most specifically, how students construct a complex argument from smaller arguments from historical documents that reflect how they read, understand and cite evidence from multiple sources. Previous research suggests that students do not learn to explain quotations or other types of evidence in their papers. Students do not develop interpretations that are supported with evidence. DBQ instruction may help students improve their persuasive essays, but not their ability to write evidence-based arguments. Explicit methods and direct instruction are needed for this. These researchers developed a Self Regulated Strategy Development (SRSD) intervention. This study measured the effectiveness of the intervention on students’ abilities to write evidence-based arguments using a cognitive apprenticeship model for instruction. H1 Students who receive instruction in analyzing sources and planning argumentative essays will demonstrate greater use of evidence from documents than students in the comparison group. H2 Students will write more advanced claims and rebuttals, after instruction. H3 Students will write longer and qualitatively better essays with greater factual accuracy and overall persuasiveness. 160 11th-grade students received instruction from four US history teachers at two schools. 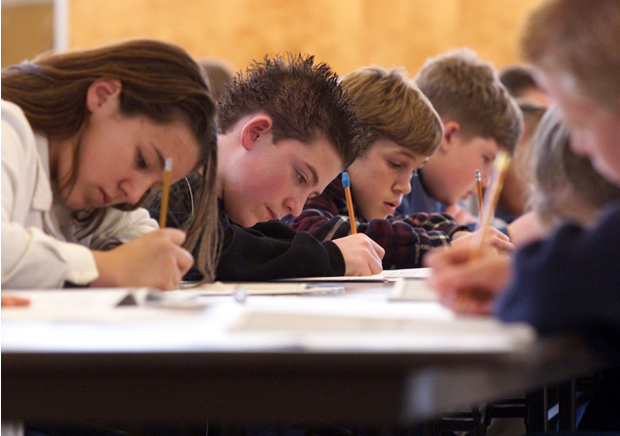 Scores on the written expression subtest of the Wechsler Individual Achievement Test, administered before the study began, were compared to determine whether the two groups differed in initial writing ability. The students initially performed at the same levels. Argumentative essays that involved historical interpretation were used for the writing task in this study. (1) develop background knowledge, (2) describe it, (3) model it, (4) support it, and (5) independent performance (Harris & Graham, 1996). Student essays were coded to identify all claims in favor of or against the position. The study counted the total number of claims, but controlled for the length of essay. The researchers counted and analyzed the number of rebuttals that students wrote, then explored their level of development by ranking rebuttals according to degree of sophistication. 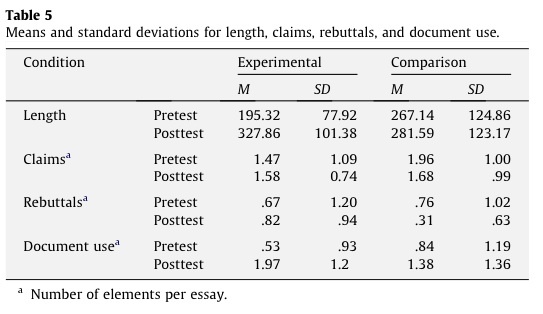 In comparison to a control group (N = 79), essays written by students who received SRSD instruction (N = 81) were longer, were rated as having greater historical accuracy, were more persuasive, with detailed claims and rebuttals. This study suggests that with explicit instruction, teachers can shape new understandings for what students expect to write and how they perform in history classrooms. Thus, numerous writing from sources assignments, paired with direct instruction in historical thinking processes, appears to move low to average high school writers to demonstrably higher levels of writing proficiency. The big takeaway is that History instructors now have a framework for how to compare measures of quality in student essays across grade levels. Effective writing instructors will concentrate on one or two elements per assignment, give students regular feedback, and report their growth. Reading and writing from multiple source documents in history: Effects of strategy instruction with low to average high school writers (2010). By Susan De La Paz, Ph.D., Associate Professor, University of Maryland, College Park & Mark Felton, Associate Professor, San Jose State University. This post describes a writing strategy for course participants in the MOOC Helping History Teachers Become Writing Teachers that will take place between January 12, 2015 – February 24, 2015. Regardless of if you are participating in the course or not, feel free to make comments, or click on the links for the original sources. Integrating Self Regulated Strategy Development (SRSD) into History/Social Science writing instruction is not taught in many teacher credentialing programs, nor is it offered in professional development seminars. Long used in elementary and middle schools to help students with Learning Disabilities (LD), SRSD is now being used with English Language Learners (ELLs) in some high schools. More than 40 studies have validated SRSD as an instructional model for teaching writing to students with writing deficits. Developed by Harris & Graham (1992), this model integrates writing instruction, self-regulation strategies, and the development of positive student attitudes toward writing. 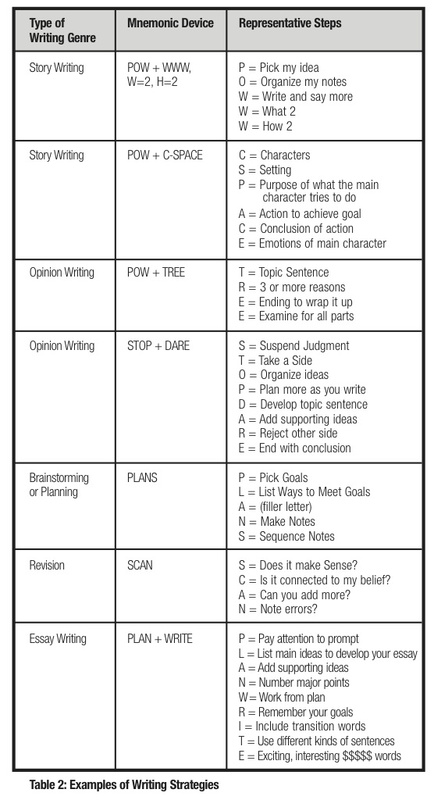 Writing Strategies All SRSD writing strategies contain mnemonics for learning strategy steps. For instance, the narrative, or storytelling strategy utilizes POW. Each letter represents a step (a) Pick my idea; (b) Organize my notes; and (c) Write and say more. SRSD considers writing a problem-solving task requiring planning, knowledge, and skills. Planning includes pre-writing, drafting, and revising the essay. Step 1 – Develop background knowledge. Increasing background knowledge. Purpose of writing. What skills are needed to achieve a writing goal? Step 2 – Discuss it. The role of student effort in learning the strategy. The self-regulation procedures. Self-monitoring. identifying reasonable, measurable, and attainable goals. Step 3 – Model it. Teachers model is completed. Students are taught how to count all the essay parts to determine whether all aspects of the prompt are answered in the essay. (Deconstructing prompt, Do-What chart). Step 4 – Memorize it. Students practice the steps of the strategy. Meaning of mnemonics used to reinforce fluency. Teachers provide students with cue cards (described above), common think sheets, planning sheets, and graphic organizers. Reminders of the critical steps involved in writing compositions. Step 5 – Support it. Teachers provide scaffolding and continuous feedback while students practice writing. Teachers may work collaboratively with the students following all of the planning and organizing steps. As students begin to master the essay writing process, scaffolds are removed. Step 6 – Independent Performance. Students write independently without graphic organizers. They user fewer audible self-statements, because they have internalized the strategy. Self-regulation refers to self-initiated thoughts, feelings, and actions that writers use to meet literary goals. When writers use self-regulation, they control their environment and behavior, including the time spent writing and organizing their ideas. Self-regulating writers develop goal-setting strategies, task-analyzing objectives, and self-reinforcement. 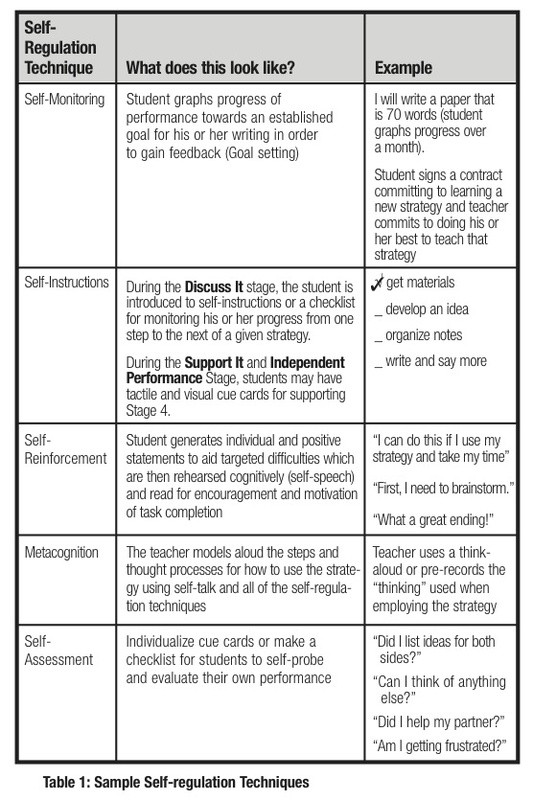 Additional self-regulation techniques include: self-monitoring, self-instructions, self-reinforcement, metacognition, and self-assessment. Further techniques are embedded into each of the six stages of SRSD writing. Environments that are supportive and pleasant develop students’ passion for writing and increase the odds that they will apply SRSD strategies. A few ways to create an inspiring classroom include: (1) establishing an exciting mood during writing time; (2) encouraging students to take risks when writing; (3) developing writing assignments that reflect students’ interests; (4) allowing students to select their own writing topics or modify assigned topics; (5) having students arrange their own writing space; and (6) encouraging students to help each other as they plan, write, and revise. Regan, K., & Mastropieri, M.A. (2009) Current Practice Alerts: A focus on Self Regulated Strategy Development for Writing. Issue 17, Spring, 2009. Division for Learning Disabilities (DLD) and Division for Research (DR) of the Council for Exceptional Children. http://www.teachingld.org. This post summarizes the Turnitin.com white paper on Plagiarism and the Web, which will culminate in a lecture for course participants in the MOOC Helping History Teachers Become Writing Teachers that will take place between January 12, 2015 – February 24, 2015. Regardless of if you are participating in the course or not, feel free to make comments, or click on the links for the original sources. Blum (2011) reported that more than 75 percent of college students have admitted to cheating and 68 percent have admitted cutting and pasting material from the internet without citing it. 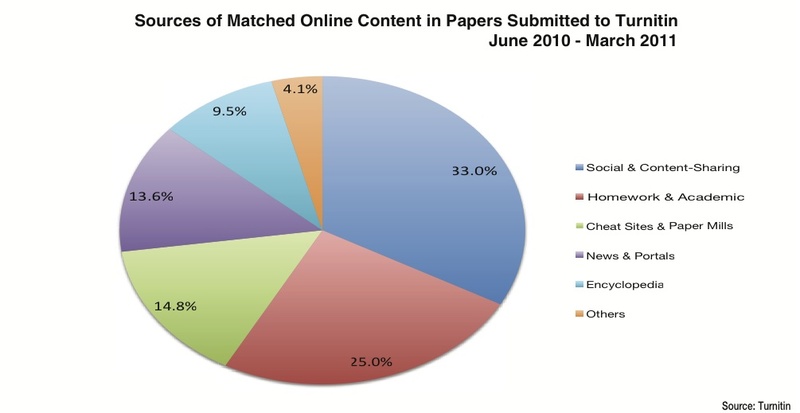 Over the last 15 years, almost 40 million student papers have been submitted to Turnitin. This study examined and classified 140 million content matches to discover which web sources students rely on for unoriginal content in their written work. The vast majority of students who have matched content in their work do not rely on cheat sites or paper mills. Many use legitimate homework, academic and educational sites as research sources. Students rely on social networks and user-generated content sites such as content sharing and question-and-answer (Q&A) sites to find content for their papers. Turnitin detects patterns of matching text to help instructors determine if plagiarism has occurred. The text in the student’s paper that is found to match a source may be properly cited, making it legitimate academic work. Social and content sharing web sites comprised the highest percentage of all matched content over the course of the study. Legitimate homework and academic help sites were second, followed by cheat sites/paper mills and news and portals a close third and fourth. The fifth most popular category was encyclopedia. The top eight matched sites for matched content were: 1) www.en.wikipedia.org 2) www.answers.yahoo.com 3) http://www.answers.com 4) http://www.slideshare.net 5) http://www.oppapers.com 6) http://www.scribd.com 7) http://www.coursehero.com 8) http://www.medlibrary.org. Only one of the top eight sites is dedicated to helping students cheat by providing unoriginal content. Out of the twenty-five most popular sites, fourteen are legitimate student resources. While close to fifteen percent of unoriginal content comes from cheat sites and paper mills, the majority of students are frequenting legitimate academic or educational web sites. Educators can guide students in proper citation procedures. With digital tools, educators can show students how much of their paper lacks attribution. Showing students a detailed report on the originality of their written work creates a teachable moment. Turnitin offers a collection of white papers on student writing and plagiarism that teachers may find beneficial. Although most students understand that quoting word for word requires a citation, they are often confused about the need to cite someone else’s paraphrased ideas. Professional authors like Stephen Ambrose, Doris Kearns Goodwin, and Stephen Glass have had problems in this area too. Turnitin claims that academic institutions adopting their service see a reduction in unoriginal content of 30-35% in the first year. By the fourth year, many institutions see levels of unoriginality in student writing falling by 70 percent. This claim, when applied to the assertion that the rate of serious cheating on written work remained stable between 1963 and 1993 (Blum, 2011, p. 2) indicates that electronic plagiarism detection tools could be beneficial to teachers and help increase the amount of writing assigned in high school and college. I am interested in hearing about your experiences using plagiarism detection tools. Do you think students are genuinely confused about the rules of paraphrasing and citing? Or are the vast majority of students deliberately copying other writer’s works? What motivates this? Does cutting and pasting happen from poor research skills or laziness? How can you create assignments that reduce the amount of plagiarism from your students? Please make a comment, or send me your questions via Twitter to @scottmpetri #HistRW. For those interested in experimenting with plagiarism detection tools, there are several free options. Blum, S., D. (2011). My word: Plagiarism and college culture. Cornell University Press. Ithaca, NY. Plagiarism and the Web: Myths and Realities. An Analytical Study on Where Students Find Unoriginal Content on the Internet. Retrieved from http://turnitin.com/static/resources/documentation/turnitin/company/Turnitin_Whitepaper_Plagiarism_Web.pdf on November 25, 2014.